ENT Specialist Dr Shyam Shastri (name changed) of Phase 6 Civil Hospital routinely visits general medical practitioners near his hospital envelopes of cheques. Shastri, who has been struggling to establish his medical practice for the past three years, has finally decided to offers “cuts” to his colleagues from the fees that his patients pay him. By handing over these cheque envelopes, Shastri has ensured that the general practitioners will recommend and refer his services to their patients. The current rate of such commissions, Shastri said, is between 40% and 60%, which means that if a patient paid Rs 1,000 to Shastri, he will have to pay between Rs 400 and Rs 600 to the doctor who referred the patient to him. He hopes to be able to stop paying commissions once he has enough patients and a practice robust enough to pay his bills. Shastri’s senior colleagues also say that they have had to offer incentives to other doctors, particularly general practitioners, at least once over their years of practice. 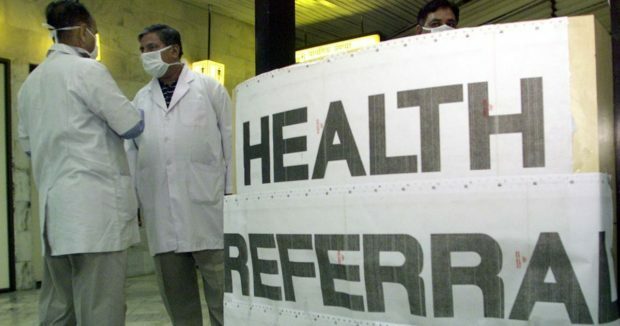 A senior doctor who works with a well-known hospital in Mohali said that at one point he was paying at least 10 doctors to refer patients to him. “I had decided to never get into cut-practice,” he said. “But, my practice was so poor that my family asked me to do it.” A well known Orthopaedic surgeon of Mohali based Corporate hospital often pays Rs 20,000/- to Rs 35,000/- Cheques to public sector doctors said Shastri. Cardiac surgeon Dr Ramakant Panda from Mohali regularly comes across patients who are advised angioplasties – a procedure in which catheters are guided through narrowing arteries to widen them or remove plaque – when they do not really require one. He estimates that 30% of angioplasties performed are unnecessary. “[Doctors] are advising getting the procedure because they get cuts,” he said. Several doctors hire public relations officers to work as agents. “These agents go to general practitioners introducing the doctor he works for and offer incentives for sending patients,” said Dr Jeevan Rajput, (Name Changed) a neurosurgeon in Chandigarh. When Rajput launched his private practice in Chandigarh four years ago, other doctors suggested that he hire a public relations officer and offer kickbacks in return for patient referrals. “I wanted to start my own hospital and initially it was tough as I didn’t even belong to a family of doctors,” he said. Rajput decided to visit doctors personally and request them to send him patients for his skills. Some obliged, others did not. “Instead of offering kickbacks, I offered discounts to patients and never insisted on a deposit, which worked for me.” Some clinics ask patients to pay a certain amount as deposit upfront, even before treatment or hospitalisation. Sometimes, an agent works for multiple doctors simultaneously, said Shastri. These agents either get paid monthly salaries or on the basis of the number of patients they bring in. Shastri had also hired an agent for some time but later decided to approach doctors personally instead. “It is then that I realised that some doctors are ethical and don’t ask for kickbacks,” he said. Doctors trying to establish their practice are given the impression that if they do not pay commissions, their practice will not survive. Moreover, corporate hospitals often set targets for doctors on how many patients they should treat and how many medical procedures they must perform in a given time frame. If a doctor cannot achieve the targets, he could lose his affiliation with the hospital. Students of private medical colleges then pay donations that can range anywhere between Rs 30 lakh and Rs 1 crore, putting great pressure on them to start earning well early in their careers. This combination of factors alarms doctors into paying commissions for referrals. In 2016, Dr Kalpdev (Name Changed), a senior medical professional from Mohali received an unsolicited cheque from a popular diagnostic chain asking him to refer patients who needed Magnetic Resonance Imaging or MRI scans to their laboratories. A shocked kalpdev filed a complaint with the Punjab Medical Council against the diagnostic chain. The incident found mention in the international medical journal The Lancet bringing much needed attention to the corruption in medical practice in India. Kalpdev blamed the cut-throat competition among doctors and laboratories for the culture of kickbacks. “If you own machinery worth crores, you will do anything to make money to pay for it,” he said, referring to the huge cost involved in setting up diagnostic centers especially those with MRI and computed tomography or CT scan facilities. In 2014, Kokilaben Dhirubhai Ambani Hospital was pulled up by the Maharashtra Medical Council for offering incentives to doctors for referrals to the hospital. A report in the Times of India, said that the hospital was offering doctors the chance to be a part of an “elite forum”. The doctors would be rewarded Rs 1 lakh for 40 admissions in a year, Rs 1.5 lakh for 50 admissions and Rs 2.5 lakh for 75 admissions. Rajput, who has studied the problem closely, estimates that at least 20% of head-injury patients do not reach the right hospital and doctor because of cut-practice. “Instead of referring to a hospital which is well equipped, we have seen that patients are sent to smaller hospitals because there is money involved,” he claimed. In rural areas, Rajput observed, doctors also pay off ambulance drivers. “Many times patients, who might have been saved, die because they went to a wrong doctor or a hospital which is not equipped well enough,” he said. Balakrishnan agrees. “The patient is actually paying for the cuts,” he said. Cut-practice has eroded trust between doctors and patients. “My relatives call me to check which doctor they should go to because they fear that their general practitioner may send them to a not-so-good doctor just to get kickbacks,” said Balakrishnan.